It happens so often now that I’m sorry to say I’m not surprised anymore: teenage boys dropping the “f-bomb” as a matter of every-day language; slouching around with no concern for others; and being just plain rude. While walking down the sidewalk in DC recently, two young men behind me used the “f” word several times in casual conversation before they jumped on their skateboards and whisked by, nearly knocking me down. At an event on a college campus where I stood in line with both young men and women for about an hour, the guys repeatedly used the crude word in conversations with the girls about mundane things like class and shopping. When was the last time you saw a young man open the door for a female or an older person - or even say, “please” or “thank you”? Let’s face it, chivalry and respect in young men are hard to come by these days. Radical feminism has taught our boys that door-holding and other such gentile behavior are insulting and smack of “gender rules” that should be obliterated from society. Further eroding our ability to teach young males the virtues of civility and just plain thoughtfulness is a media culture steeped in crude, selfish and foolish male images. Battling a culture that devalues civility in general and purposefully attacks tradition makes it seem impossible to teach our sons how to be gentlemen. Where can a parent go for help? Join the Boy Scouts of America. This year marks the 100th anniversary of one of the finest organizations the world has ever known. As a mother of two Eagle Scouts, I can personally attest to how Scouting reinforced my husband’s and my efforts to teach our young boys to become men of honor. In Scouting, you and your boys are surrounded by other parents and families who seek to grow males who are thoughtful, true to their word, polite and chivalrous. They work hard, play hard, strive to achieve meaningful goals, and are taught to help other people. And what is the Scout Law referred to above? It defines twelve virtues a Scout must be including: trustworthy, loyal, helpful, friendly, courteous, kind, obedient, cheerful, thrifty, brave, clean and reverent. -Helpful: A Scout is concerned about other people. He does things willingly for others without pay or reward. -Friendly: A Scout is a friend to all. He is a brother to other Scouts. He seeks to understand others. He respects those with ideas and customs other than his own. -Courteous: A Scout is polite to everyone regardless of age or position. He knows good manners make it easier for people to get along together. -Kind: A Scout understands there is strength in being gentle. He treats others as he wants to be treated. He does not hurt or kill harmless things without a reason. Of course, the best way to teach your son to be a respectful human being is to model the behavior yourself. And being involved with other adults who behave that way too will have a tremendous impact on your son. Besides offering that support, for millions of families like ours, Scouting creates countless wonderful memories for both parents and sons that will long be cherished. To find your local Council and how to take the first step in joining an organization that still believes a strong man is an honorable and thoughtful one, log onto Scouting.org. 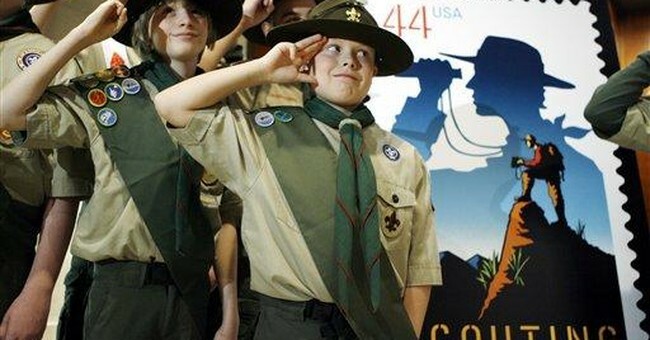 Happy 100th Anniversary to the Boy Scouts of America. I will always be grateful to you for the many happy times and for helping me raise young men of valor.